This vine produces huge blooms that have a unique star-shape. Many of the blooms are semi-double, and the mix produces the brilliant colors of red, white, and blue. 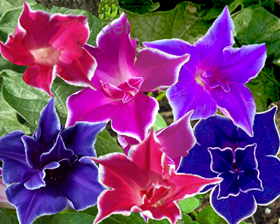 This climbing vine will bloom early and load itself with masses of attractive, brilliantly colored flowers all summer long. Sow March to April. Soak seeds overnight in tepid water before sowing. Sow seed, 6mm deep and cover seeds with a layer of compost or vermiculite. Place in a propagator or seal container in a polythene bag and put in a warm place, and keep at a temperature between 20-25C.Germination will usually take 7-30 days.